Girl Rising has partnered with the International Rescue Committee, Citi, HP and Amplifier to create a film and campaign around the story of one brave young woman named Nasro. Brave Girl Rising, to be released this March on International Women’s Day, is written by the poet laureate Warsan Shire and narrated by actress Tessa Thompson (Selma, Creed, Thor and the upcoming Men in Black International). In our previous blog posts, we explored the refugee crisis and introduced you to Warsan Shire and Girl Rising. 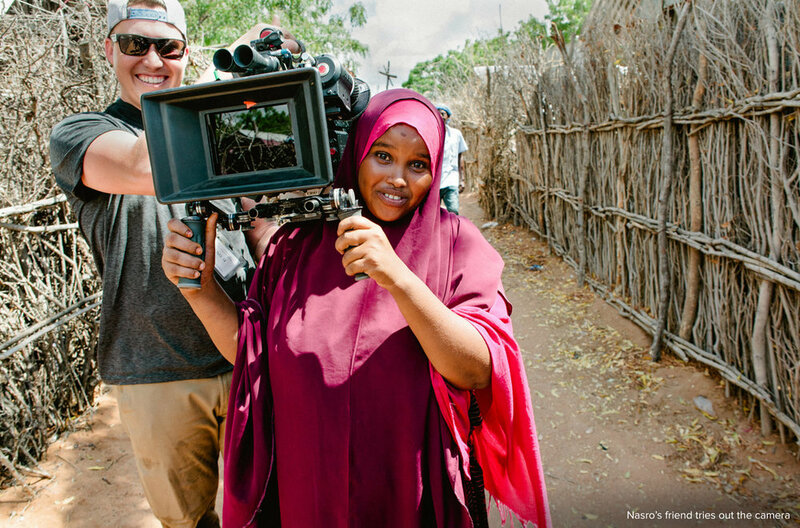 Today’s blog takes us to Dadaab Refugee Camp, as Richard Robbins, who directed the film with Martha Adams, discuss what it was like to film the story. Getting to Dadaab takes a long time. Nasro made the trip from Somalia with her grandparents when she was seven. Some of it was travelled on foot. Some in busses. It took nineteen days. First impressions are misleading, as the things you see don’t tell you the story of this place. There is no fence keeping people here. It’s only the geography and periodic check points that makes this place nearly impossible to leave. The place itself is less bleak visually than I had expected. A few splashes of rain at the start of the rainy season in October, had given the landscape an unexpected injection of lush green. Above the reddish earth that permeates everything (including nose and ears) is a sky that is blindingly blue with bright white clouds. The place is not quite beautiful, but it is often very striking. Everyone lives in little mini-compounds each encased in six-foot tall rows of woven sticks. In an odd way, there is a lot of space; it didn’t feel cramped the way refugee camps I’d visited in Haiti or Pakistan did. I suppose the one thing in abundance there (aside from aforementioned red dirt) was space. The only reasons to stay clustered together were safety and proximity to water pumps. But in a place mostly behind fences, the red dirt streets can often feel deserted. Which, of course, makes everyone feel a little spooked and vulnerable—like you’ve constantly made a wrong turn into someplace you’re not supposed to be. The truth is that most of the time we couldn’t allow ourselves too much space to think very deeply about the human tragedy that we were surrounded by. I feared that if I really let my mind take it all in, I’d be paralyzed by the scale of the suffering and the relative hopelessness of the lives unfolding here. If we think of freedom as the basic right to pursue your own life choices then it’s hard to deny that these people, hundreds of thousands of them, are not free. And maybe the girls are the least free of all. That’s a tough thing to accept. But it kept us working especially hard to tell a story about a girl who thrives and fights and dreams. We moved in small convoys, with armed security always at hand. In a place where very little happens, we were something of a spectacle. Whenever we stopped, we were surrounded by literally dozens of children within seconds. They gawked at us openly for our strangeness, our whiteness, and our general other-ness. The entire thing was barely controlled chaos, but when the camera rolled, we actually made some amazing shots. I think we all felt deeply grateful for the chance to do this work. It has been true from the very beginning of Girl Rising nearly ten years ago: this project just attracts the most amazing people. This particular crew mostly consisted of two directors, one producer, one cinematographer, one assistant camera, one all-purpose tech wizard, one sound recordist, one local producer, one translator, one IRC communications representative, an amazing IRC fixer, three drivers, one head of security, eight security officers, two PAs, a dozen assorted non-professional actors including Nasro, a Somali stage mom, another dozen Somali refugees going about their business and roped into service… and I’m sure I’ve forgotten someone. Plus, we were working in three languages (Somali, Swahili, English) and across cultural barriers that are difficult to fathom, much less explain. Somali refugees embraced our project with a combination of amusement and disbelief. I feel pretty certain that they think we were all crazy people who run around yelling to each other, guzzling water, sweating profusely, and asking the actors to perform the same actions over and over again while we watch from different angles. We try and explain what we’re doing a lot, but they still think we’re bonkers. The incredible, unfathomable gift in the midst of all that was Nasro. She has impossible confidence and swagger for a girl who has been dealt a tragically bad hand in life. She’s a refugee in an oft-forgotten part of the world, a female in a male-dominated society and—with her dark skin, often discriminated against even within her own community. She seems to somehow inherently know that she is worth more than all this. Not entitled, but definitely deserving and magically fearless in her pursuit. We were first introduced to Nasro by the International Rescue Committee. 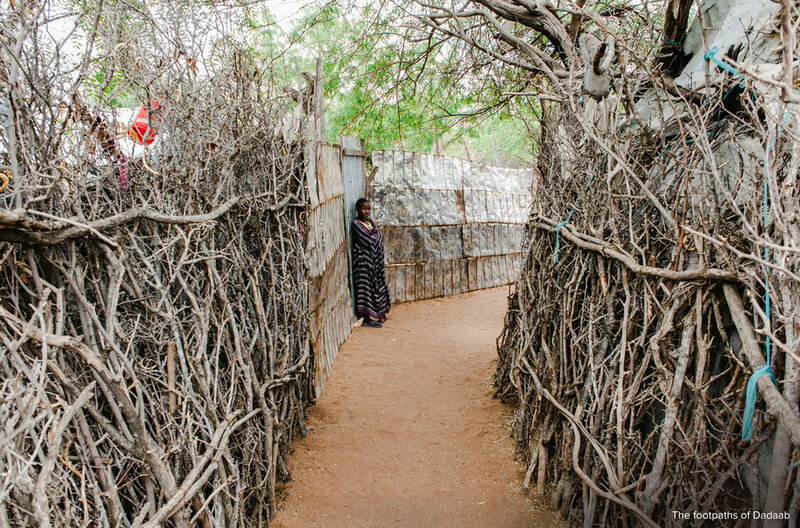 She is supported by their Women’s Protection and Empowerment program in Dadaab. Like all the young women Girl Rising has profiled, Nasro turned out to be just as complicated and unpredictable as any American 17-year-old girl you know. We tried to imagine what it must be like to have lived most of your life here in this brutal place, and then suddenly be thrust into the center of a manic whirlwind of American filmmakers. She handled it with a lot of poise... and a little attitude. As I think back on the experience, Dadaab—the place—it already feels strangely vague to me. I think that’s because in many ways it isn’t a real place. It is not a home. It’s not a city or town. It has no permanent context. It is a limbo, a warehouse. It feels without context or history—disconnected from the world that the rest of us live in. It sprang up here 30 years ago to try and create refuge for desperate people facing a crisis. And though it saved many from that crisis, it created another one. It became a different kind of tragedy. It was a hard trip. Both physically and emotionally. But for us it was just that: a trip. For the people I came to know and love in Dadaab, it isn’t a trip. It’s their life. It hurts to remember that fact, as I do each day while I complete the film back home in the comforts of L.A. Perhaps I have an odd glimpse of one tiny surreal piece of a refugee’s experience? I miss a place I never want to go back to.